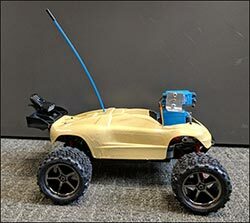 The HIVE (Hydraulic Inspection Vehicle Explorer) is a radio-operated remote car that allows roadway managers to inspect culverts and pipes to determine if repairs or replacement is required. This vehicle was built by NDLTAP for use by county, municipal and township road managers to use free of charge. The device was developed by Minnesota DOT (MnDOT) Rochester District, and MnDOT has multiple devices inspecting their culvert inventory. The DCP test is used to measure the in place strength of the road bed and layers underneath. This DCP has been loaned to NDLTAP from the NDDOT Materials Division. It can be borrowed out to local agencies to help them determine the strength of their gravel surfaced roadways. To loan the Ball Bearing Bank or Slope Meter, please contact the equipment administrator.